The New York Times and Washington Post have both recently weighed in with editorials about John Kerry’s peace process. First the New York Times ran The Ticking Mideast Clock. Signs of failure are everywhere. On Thursday, standing beside Mr. Kerry, Israeli Prime Minister Benjamin Netanyahu delivered a harsh assessment of his Palestinian counterpart, President Mahmoud Abbas, and, implicitly, the prospect of a Middle East peace agreement. Days earlier, Israel let it be known that it would build more settlements in the West Bank, further poisoning the political atmosphere while shrinking the territorial space for a deal. Hard-liners in Mr. Netanyahu’s government are pushing a bill that would annex settlements in the Jordan Valley area of the West Bank, where about 6,000 Israeli settlers and 10 times as many Palestinians live. So what did Netanyahu say? A few days ago in Ramallah, President Abbas embraced terrorists as heroes. To glorify the murders of innocent women and men as heroes is an outrage. How can President Abbas say that he stands against terrorism when he embraces the perpetrators of terrorism and glorifies them as heroes? He can’t stand against terrorists and stand with the terrorists. And I’m wondering what a young Palestinian would think when he sees the leader of the Palestinian people embrace people who axed innocent men and women, axed their heads or blew them up or riddled them with bullets. What’s a young Palestinian supposed to think about the future? What’s he supposed to think about what he should do vis-à-vis Israelis and vis-à-vis the State of Israel? So it’s not surprising that in recent weeks israel has been subjected to a growing wave of terrorist attacks. President Abbas didn’t see fit to condemn these attacks even after we learned that at least in one case, I stress at least in one case, those who served and are serving in the Palestinian security forces took part in them. In the six months since the start of peace negotiations, the Palestinian Authority continues its unabated incitement against the State of Israel. This Palestinian government incitement is rampant. You see it in the state-controlled media, the Government-controlled media, in the schools, in text books, in kindergartens. You see it in every part of Palestinian society. So instead of preparing Palestinians for peace, Palestinian leaders are teaching them to hate Israel. So how did the editorial present Netanyahu’s remarks? In his remarks on Thursday Mr. Netanyahu claimed that members of the Palestinian security force were involved in a recent attack against Israelis. Mr. Abbas should investigate the claim and, if it is true, bring those responsible to justice. He also needs to crack down on the incitement of hatred against Israel in Palestinian schools, textbooks and government-controlled media. As part of the negotiating process, Mr. Netanyahu agreed to release 104 Palestinian prisoners from Israeli jails over nine months rather than halt settlement construction. But when Mr. Abbas welcomed the latest group to the West Bank this week, Mr. Netanyahu accused him of embracing terrorists, even though Mr. Abbas never condoned the prisoners’ crimes. If Mr. Netanyahu felt so strongly about the prisoner releases, he should have chosen instead to halt settlement construction. First of all, I don’t assume that Netanyahu made his charge about the participation of the Palestinian policemen without proof. But don’t expect Abbas to do anything. Of course the crackdown on incitement is twenty years overdue, why would the Times expect it to happen now? But of course, as Honest Reporting points out, the Times is not accurate about Abbas condoning terror. But aren’t houses less important than justice for the murdered? Of course. However, unlike the release of terrorists, a construction freeze is fundamentally related to the substance of the negotiations themselves. That is, of all the proposed “gestures,” the freeze would not only be problematic in itself, but would have Israel start negotiations on its back foot. Not allowing Jews to build houses in most of Jerusalem, in settlement blocs like Gush Etzion, Maale Adumim, and elsewhere that would surely remain under Israel sovereignty sends one message: we have absolutely no right to be here. We are trespassers. It is one thing to say the Palestinians can have a state because of demographic reasons, international pressure, and so forth. It is another thing to say we are trespassers in the Old City of Jerusalem and Hebron, where Jews lived until being expelled by Arab armies and mobs. A settlement freeze in effect agrees to the 1967 lines as the basis for negotiations–which even if it were a good idea, is a lot more than a “gesture of good faith.” It is one thing to say these territories should become Palestinian territory. It is another to say Israel took them from the Palestinians, that they always were, as Abbas claims, Palestinian territory. Of course, the way the narrative of the peace process is structured, Israel should not be surprised at the pay-to-play. And for this situation, the tireless proponents of “peace” bear primary responsibility. If, as the left argues, Israel needs peace more than the Palestinians need it, no wonder the Palestinians will charge Israel heavily for the privilege of giving them a state. The editors of the New York Times may scoff at Netanyahu’s unwillingness to cede ground, but it is the peace process, as they advocate, that is the biggest obstacle to peace. Even the editorial’s lukewarm call for an end to incitement comes across more as an afterthought, a grudging acknowledgment of Israel’s concerns, not a sincere demand of the Palestinians. After all, how many New York Times editorials over the past twenty years even mentioned the word? 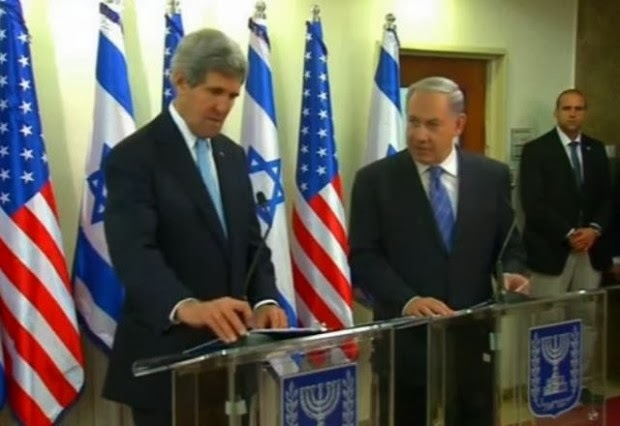 The Washington Post’s Will John Kerry’s Mideast peace framework bring results? is somewhat more balanced. With the end of a nine-month term of negotiations approaching in April, Mr. Kerry last week shifted away from trying to push the two cautious and reluctant leaders toward accord on the terms of Palestinian statehood. Instead he pressed them to consider a U.S.-designed “agreed framework” that would set out principles for resolving what Mr. Kerry called the “core issues” while leaving difficult details for future bargaining. That pushed both sides to “a point where the choices narrow down and the choices are obviously real and difficult,” as Mr. Kerry put it. According to Israeli and Arab news reports, Mr. Abbas must decide whether to accept the notion that Israeli troops would monitor the eastern border of a Palestinian state for an extended period and whether to acknowledge Israel as a state for the Jewish people. Mr. Netanyahu must consider whether, in exchange for such potentially historic commitments, he would agree that the territory of the Palestinian state be based on Israel’s 1967 borders and that its capital be in greater Jerusalem. But “more balanced” doesn’t necessarily mean fair or even correct. Why should Netanyahu agree to the 1967 borders as a baseline for negotiations? Israel’s critics love to say that the United States has never supported settlements. But historically, the United States (and most of the world) never supported a return to the 1949 armistice lines. As far as getting “historic commitments” from the United States on the Jordan valley and the acceptance of Israel as a Jewish state, the first is a necessity given the disaster that ensued following Israel’s withdrawal from Gaza and the second is really a prerequisite for any peace. The Palestinians shouldn’t be rewarded for failing to acknowledge the Jewish historic right to the land of Israel for the past twenty years. In fact, the camp headed by Mahmoud Abbas represents a minority in the PLO (and even within the Fatah movement), in the Palestinian territories (the West Bank and Gaza), and in the Palestinian diaspora. The PA is not capable of making historic decisions based on concessions regarding basic Palestinian positions. Even if one assumes the good faith of Mahmoud Abbas (something I do not assume) his power is limited. He has no ability to deliver peace or foster coexistence (even if he wanted to.) And yet these opinion makers assume (along with John Kerry) that it is somehow in Israel’s and Netanyahu’s interest to make “difficult” and likely irreversible choices to make a deal that cannot be consummated. Technorati Tag: Israel and Media Bias and Abbas and Terrorism.